Will Hadrien David be OKJ's new frontrunner? After the recent success at La Conca, for round three in WSK, Hadrien David is set to take on a leading role in OKJ. A success the Frenchman built across the weekend. 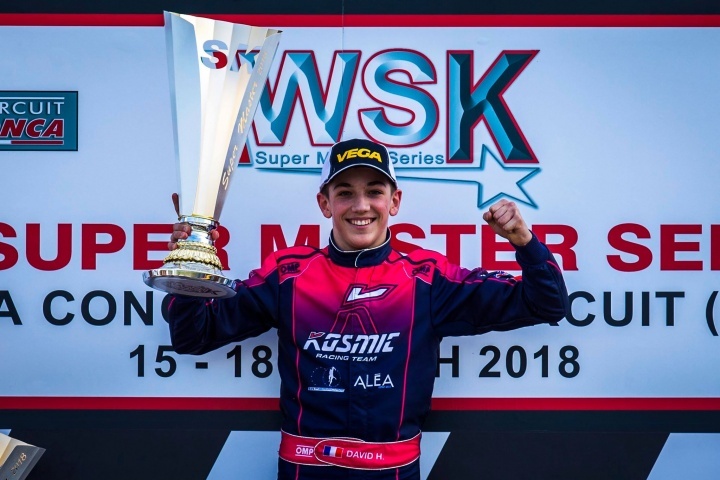 Increasingly competitive with the colors of Kosmic, David will certainly be among the drivers under the magnifying glass and in the spotlight, starting from the first CIK FIA round in Sarno (20-22 April). A much-deserved victory, his, on the track of La Conca against rival Gabriel Bortoleto, second. With a victory won, and the round of Lonato to be recovered, the French kart driver rises to fourth place in the general rankings. Below, a quick talk with Hadrien David, the author of a breathtaking pass - on two wheels! - during the category final. The overtaking earned him the victory. Hadrien, tell us about your weekend. "The weekend started pretty bad. I made a mistake in qualifying, that's why we did the 19th time. But the the team then did a perfect job. In the heats we got two third places, a fourth and a victory - always with great speed! I started fourth at the prefinal A where I started to recover ... I was in third place at the end of the first lap. After I passed Van Hoepen on the 2nd lap, thanks to the perfect material of the Kosmic Racing Team, I managed to get to Aron and overtake him." Did you expect to be so competitive? "With the team we did two days of testing before the race and the pace wasn't bad. Even in the WSK free practice we had a good pace, and we were always competitive." Can you describe your great pass? "It was incredible. I was almost shocked by what happened! After, with the perfect physical and mental preparation of 321 Perform, I managed to stay focused on the end of the race."